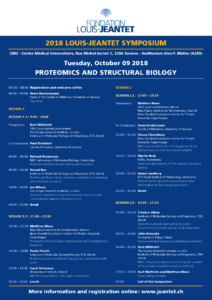 The seventh edition of the Louis-Jeantet Symposium will be organised by Matthias Mann, 2012 Louis-Jeantet prize winner, Max-Planck Institute for Biochemistry, Munich, and Kurt Wüthrich, 1993 Louis-Jeantet prize winner, 2002 Nobel prize winner, The Scripps Research Institute, La Jolla, and ETH Zurich. The sessions will be co-chaired by Paul Guichard, Faculty of Science, University of Geneva, and Denis Hochstrasser, Faculty of Medicine, University of Geneva. During the Symposium, the chairpersons and speakers from institutions in Switzerland, Europe, the USA and Japan will report on the progress of their work and share the status of their respective domains of research. 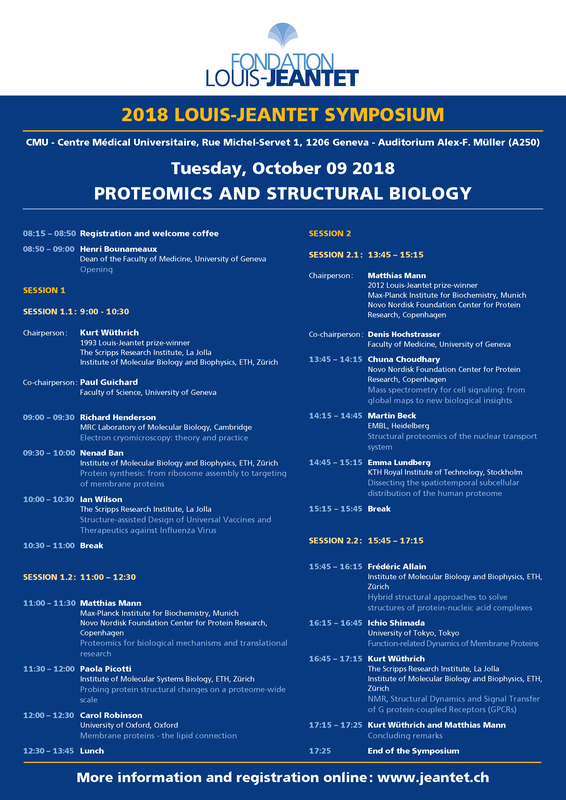 The Symposium is a unique opportunity for Master and PhD students with an interest on proteomics and structural biology to meet with leading researchers.